Let's go back in time, before we start today's project. 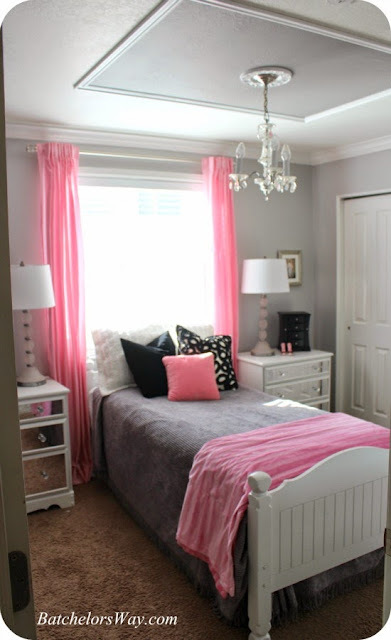 Remember in my first post about Ashlee's room revamp? I wanted a taller headboard for her. Let's look closer into why? Emilee's half of the bunk bed is in front of the window. It was perfect and I felt no need to see more of it. A taller headboard would have just blocked the light. So I just gave it another coat of white paint!! But Ashlee's bed was positioned on a blank wall and needed more presence. I am adding a box spring beneath the mattress, which means only a sliver of the head board would show. And once I put some pretty pillows on the bed there would be none of it showing!! Buying a new bed seemed dumb since I had a perfectly good one, besides, I liked how high the bed rails were off the ground for extra storage. So I just decided to make some minor changes to this here bed!! 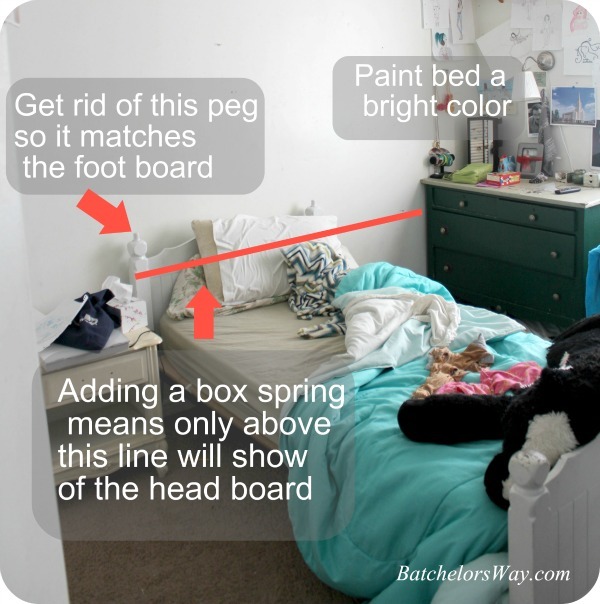 I wanted to get rid of that awkward peg that was used to connect the bunk beds. I wanted to paint it a fun bright color, and I wanted to raise the head board a lot!!! Challenge one, and definitely the hardest, was how to make this baby taller!! Once I had a plan in mind I set out to find what I needed. I wanted a square post the same dimensions as the bed posts. Any lumber I could find was too big including landscaping timbers. I decided I would just have to cut something down. But I made one last ditch effort and stopped by my favorite second hand store DI. I felt my heart beat double when I saw this awesome bed!! Maybe it didn't look super awesome, OK it looked crappy with it's worn finish and rickety connections, but I was only looking at the posts!! I measured and believe it or not they were the same size as my bed posts!! To make it even better the bed frame was only $10. The lumber I was heading to Lowe's to buy was going to cost well over that!! First step was to disassemble the bed frame I had just bought. 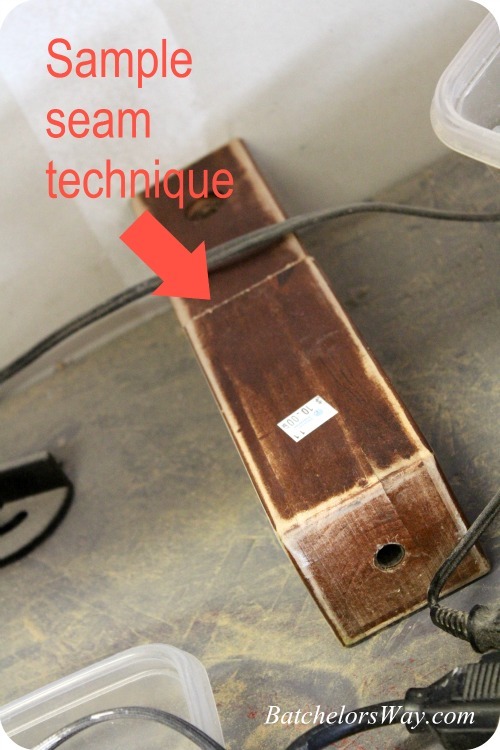 Once I had the wood posts I needed to test my technique. I made a sample by cutting a section apart and seaming it back together. After waiting a day for it to dry I tested this thing and it was solid!! So I went forward with my plan! I wanted to retain the feet so it would still match the foot board. So I cut a few inches above the foot. Measure so you can get both sides the same. I had a helper and we cut the legs off on our chop saw. Next I used a square to help me mark the middle of the posts. Find a spade drill bit that is just slightly larger than your dowel and drill a hole about 1 1/2 inches in all post ends. Next I cut the new wood posts that I was going to insert. I wanted to add 20 inches of height, so I cut the new post 20 inches. 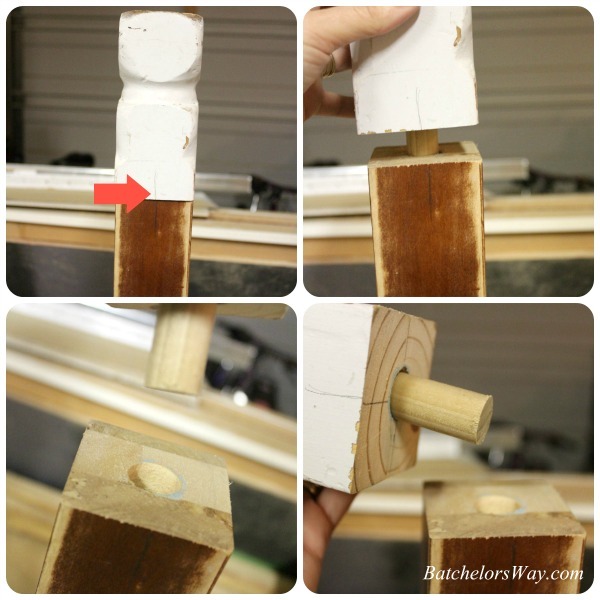 Once I had holes drilled in the center of all the posts I cut dowels about 2 3/4 inches and inserted them in the holes. They actually turned out to be about a paper's thickness difference between the old and new posts. So I rotated the two pieces until I got the straightest looking posts. Then I marked a line across the seams. This way I could line things up easily while gluing it up. I used a generous amount of wood glue in the holes and glued all the post sections together and let it sit flat so it could dry really well. I think it's looking pretty good!! Now I had to add one more piece of MDF so there would be solid support from the top of the mattress up. I just used my Kreg Jig to attached it. I know I must be crazy!!!! 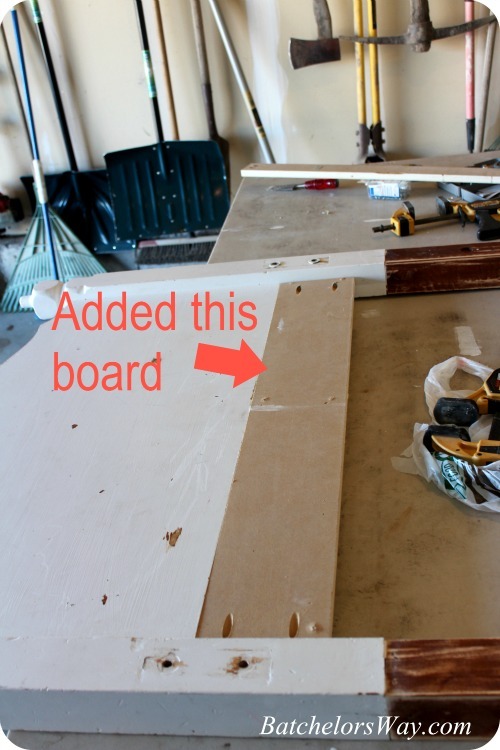 So far I have only spent $10 on the used bed frame, the dowel and MDF scrap I just had leftover from other projects. Next time we will see how well my plan worked. I love your low cost diy ideas! 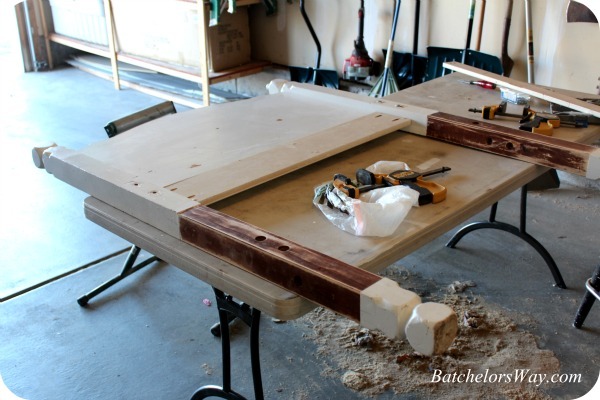 I have often wondered how to make a headboard taller. Can't wait to see the finished room.